This week National Public radio released the brand new NPR One mobile app, which site side-by-side with the previously launched NPR News app. The first was a reinvention of the NPR listening experience. The new app reinvents that, with simplicity and style. When NPR released its NPR News mobile app, it furthered its digital identity by breaking apart audio programs into component stories, nad letting user pick and choose randomly. Navigation assitance in that app is provided by a main menu that divides the experience into top stories, topics, programs, and stations. Click topics, then Politics, and you get today’s top NPR audio segments from the political world. The result of that earlier app was, and is, a satisfying lean-in experience, and a consumer-friendly brand extension for NPR. The subtext is that NPR fans don’t have to listen to programs according to the broadcast schedule, or even pay attention to the schedule. The app separates from the terrestrial footprint, encourages embracing the brand on multiple platforms, and customized the experience to match the listener’s expectation on the mobile platform. This week, with the release of NPR One, a new mobile experience, the public broadcaster reinvents its reinvention. Leaning in is replaced by leaning back, resulting in a mode that resembles radio listening. But the programming is customized, and certainly more automated than in the NPR News app. NPR One is engineered around a single continuous playlist, somewhat influenced by Pandora on the music side of the fence, and resembling Swell Radio (which was coincidentally shut off this week after a presumed acquisition by Apple). It makes it easy to tune in (via the Internet) your local NPR station, or to let the app stream top recent stories, programs, and segments tailored to your location and what it learns about you over time. A skip button moves on to the next playlist item, and you can look ahead by swiping. 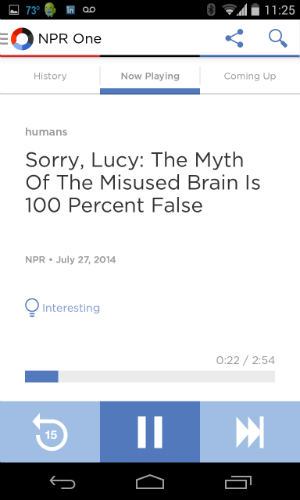 Skipping probably helps NPR One understand your taste, and certainly the “Interesting” button does. There is no way to “thumb down” a story (to borrow Pandora’s term), which keeps things both simple and positive. The whole app is a marvel of simplicity and elegance. It is easier to use than Pandora (rto continue that comparison), because you don’t have to enter anything to get the sound going. (Pandora requires new users to put in an artist, band, or song.) NPR One doesn’t ask you anything; it quietly undertakes to learn about you over time. In our testing, we appreciated the 15-second back button (similar to Netflix and Prime for video), which is arguably more important for a spoken-word app than a music service. With NPR One playing in the background, a news item might catch your ear, and you can scoot backwards to listen more carefully. When you feel like leaning in, NPR One provides a search form. We struck out with obvious search terms “clinton” and “hillary clinton.” We can’t believe NPR has nothing to serve up regarding the ever-newsworthy Ms. Clinton, especially since the NPR News app eagerly fed us content. We conclude that something is wrong with the Search function, or that NPR One maintains an intentionally small inventory of available clips. That’s a bit troubling, but also somewhat beside the point. NPR One is about leaning back as if it were radio, and consuming personalized content as if it were searched for. Whereas NPR News detahced the listener from broadcasting, NPR One puts the listener between the terrestrial schedule and random-access timeshifting. And does it with beautiful style.